At last count, LinkedIn had over 225 million users in 200 countries. That’s an amazing potential client base to tap into. As an owner of a photography business, you would be extremely happy to capture even a fraction of those users. To accomplish that goal, you need to treat LinkedIn like your other marketing strategies. In other words, you have to work at maintaining a strong presence. You can’t just put up a profile and wait for the clientele to come your way. You should be devoting at least an hour every day to searching across LinkedIn, building out your profile and participating in forums. This is how you’ll get the word out about your business. Here are some helpful insider tips for how you can power up LinkedIn to grow your photography business. By now you’ve probably accumulated a decent amount of satisfied customers from your photography business. Those same happy customers have no doubt already recommended you to their friends. Why not extend those recommendations across the LinkedIn forums? Ask your customers for a written testimonial that can be published on your profile and then shared with all your connections. If those customers are LinkedIn users, they could also share on their networks as well. Incidentally, those same testimonials can be put to good use on your business website. How many wedding planners are on Linkedin? How many caterers? What about DJs, florists and dress makers? The short answer is “a lot!” These are all the folks who do business with couples about to get married. These would be the same couples who need a photographer. That is just one example of how you can reach out to other business professional across LinkedIn to spread the good word about your business. Even if you aren’t in the wedding business you’re sure to find plenty of support businesses you can tap into. As you reach out to other business professionals, you might uncover opportunities to expand your reach beyond LinkedIn but through LinkedIn. As you search through the LinkedIn Groups directory you could stumble about business expos that you could benefit from attending. Beyond the typical associations that would directly be related to your photography business, you might also look for various hobby groups like car collectors, Civil War reenactors and pet lovers. All of those folks would benefit from having a solid photographer snapping pictures for them. Show at one of their “real world” events with your camera and watch what happens. As you enter into the world of LinkedIn forums you have the opportunity to make new contacts and share your expertise. By answering questions about what you know best, you’ll have a chance to win over new customers and not just those who asked the question in the first place. Those same answers you provide will be available to anyone making a search utilizing LinkedIn’s Advance Answers Search. You should defiantly consider starting up your own blog where you can share some of your latest work and offer your own photography tips. Keep that blog current and engaging and you’ll start to build up traffic. Those same forums can help you stay on the cutting edge of technology in your own industry. Here is where you can get the latest news on equipment updates and pick up terrific technique tips. It’s all part of the big exchange of ideas that is at the heart of LinkedIn’s community of users. You won’t be the only photographer on LinkedIn. This means you can check out the competition to see how they are attracting new customers. Unless you’re doing all of your business remotely, those other photographers won’t feel threaten by you dropping in and asking questions. Who knows, you might even become inspired to tackle a new kind of subject in your own business. Just as you’ll be sharing what you know about photography, there will be other professionals sharing what they know. This includes areas like taxes, commercial leases and accounting. Once you’ve established your network and social contacts there is no reason why you can’t reach out and ask these other professionals all your questions. When you can improve the “business” aspect of your business then it stands to reason you’ll be free to expand and find new customers. As a photographer you will have worked with plenty of other professionals from wardrobe stylists to make-up artists to hair stylists. You’ll be able to offer referrals to someone looking for those types of businesses. In return, you could have the referral coming back in your direction. Bottom line: Put LinkedIn to work for your photography business starting now! This entry was posted in Photographer Social Media Tips and tagged connecting with photographers, customer reviews, forums, linkedin on February 20, 2014 by digilabsprowp. Social media sites have become a crucial marketing tool for many professional photographers. Letting brides-to-be know that you offer high-quality, personalized services is key to winning new clients. Many wedding photographers are now turning to Pinterest, an incredibly popular online pin board. Users create their own unique boards and pins photos, articles and other content from around the web. Recent statistics indicate that 68.2 percent of all users on Pinterest are female. Users tend to spend about 89 minutes per week on Pinterest, which is much more time than is spent on Twitter or Google+. Experts estimate that women spend more time pinning on Pinterest than they do hanging out on Facebook. Almost 30 percent of all users are between the ages of 25 and 34. Pinterest holds special promise for photographers. When the site was launched in 2010, one in five couples used the boards for wedding planning. Today, one in three couples getting married in the U.S. will use Pinterest to gather wedding ideas, look for dresses and scout for photographers. A whopping 4.3 percent of all pins on the site are wedding related. Two of the site’s 10 most popular boards are all about weddings. This entry was posted in Photographer Social Media Tips and tagged Photography, Pinterest, professional photography on October 31, 2012 by DigiLabs Pro Blogger. In theme with FOTO Friday, DigiLabs Pro has started a new weekly affair on our facebook fan page. Each Wednesday we’ll post a picture and ask our facebook fans to provide a plausible comment for the image. This week we started the fun with this great pet portrait! 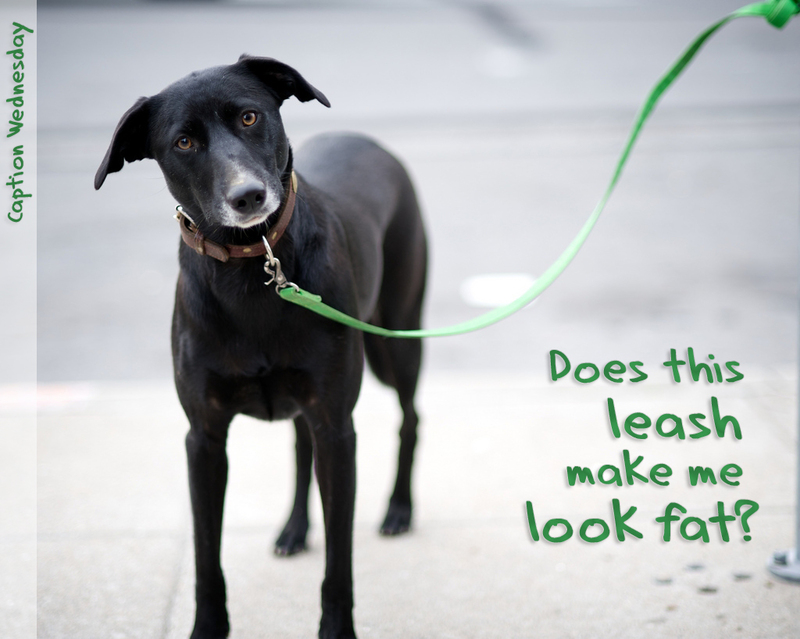 We were so excited to see all the participants and loved your responses but the clear winner was Heidi Litchfield with ‘Does this leash make me look fat?’ See all the comments here. Hope you can get into the fun next week! This entry was posted in Photographer Social Media Tips and tagged DigilabsPro, facebook, Photography on September 23, 2010 by DigiLabs Pro Blogger. DigiLabs Pro is starting a new friday staple on our facebook fan page called ‘Foto Friday‘. Here is your opportunity to share with us your best image of the week. Don’t have one? Share someone elses! This entry was posted in Photographer Social Media Tips and tagged digilabs facebook, foto fiday on May 28, 2010 by DigiLabs Pro Blogger. Getting to know you. With growing competition, you must make sure that clients see something different in you. A great way to stand out is to let your customers get to know you for the person you are rather than as a business. Share your thoughts, work, and life and let potential clients feel that they know and trust you before ever even meeting with you. It is a careful balance of personal and professional but be yourself. Creating a personal relationship is vital for a photographer whose job is to capture someone’s most personal and intimate moments. Social networking makes this personal connection (before you even meet!) easy and cost-effective. You are reaching people who you don’t even know exist. In front of customers 24-7. Social networking is growing fast, people like to research companies and follow them online. Some estimates claim that 77% of active internet users read blogs, which amount to approximately 133 million people. Twitter sees about 3 million tweets a day and Facebook has over 200 million active users. That is a lot of people! With that comes plenty of opportunities to gain new customers and grow your business. This is a means of communication that enhances business interactions of the past. In sight and in mind. We have all heard of the saying – out of site out of mind, and these days you better believe it. Social networking lets you easily stay in touch with a broad customer base for a minor bit of your time. (okay, if you blog a lot, that time can really add up) Staying in your clients’ lives will not only ensure their future business but it actually can be a source for great referral work… and we all know how important word of mouth marketing is! Make sure that your marketing activities are connected. When you post a new blog, make sure to tweet about it and post it on your Facebook. Add your Facebook, Twitter and blog links to your email marketing activities and to your website. Always include a link for easy access. When you blog, think about how you can improve your organic search rankings. Blogs are a great organic search (SEO) tool. Make sure you use relevant keywords (top priority is making sure the content is relevant for the reader) and provide links back to your website. Comment or post on your clients’ Facebook pages or comment on their tweets. Don’t spam them, that is a sure way to turn off potential clients. Instead, make relevant comments or complement them on the activities going on in their lives. Make sure the content is relevant. Stay involved in the online professional photographer community. Visit others blogs and Facebook pages. Make relevant comments and/or posts. This will both increase your exposure and keep you up-to-date with what is going on in the industry. Keep your Facebook, Twitter, and blogs fresh and interesting by posting and updating them often. This will help with gaining loyal followers. I love reading this blog – there are some great stories about Ben and Erin’s fun couples. Of course, the photos are breathtaking and once in a while it allows me to pretend (for ten minutes) that I am sitting on a beach somewhere in Mexico or Greece. I love Erin’s blog for its fun atmosphere. I think the saying “sharing is caring” was said just for her. Erin tells her reader, in a very personal manner, everything that happened at the event. After reading a few of Erin’s blog post, I now think of her as a friend. She is the best at including some personal photos, such as family holiday happenings, her furry friends – all with great background stories. Pheewww, okay I rest my case. My parents always tell me that I was meant to be a lawyer. So if you have any questions (or I just haven’t convinced you), I would love to hear from you. Chat with you here again…and of course keep on following our blog… and make sure to become our friends on Facebook and Twitter. This entry was posted in Photographer Social Media Tips and tagged professional photography, social media marketing, Social Networking on February 23, 2010 by DigiLabs Pro Blogger.